Ectopic Ents is proud to announce the release of the Foetus Of Excellence t-shirt , originally included in the long out-of-print Foetus Of Excellence box. The Foetus Of Excellence was released in 1985 as a box to hold all the Foetus vinyl releases that had been issued up to that point on Some Bizarre, and it included a shrink-wrapped t-shirt with the shield design printed on it. It was limited to 836 pieces, exactly enough to break even, and sold out immediately, making it the one and only release to make the UK independent charts without having a musical recording included. This classic iconic design has been selling for exorbitant prices, so we are thrilled to make this fine item available again. 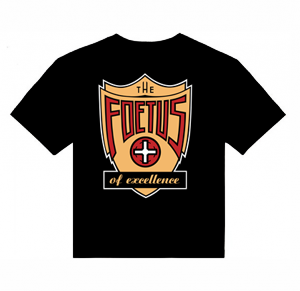 The Foetus of Excellence shirt has a three color design, including a metallic gold, red and white, making it perfect for formal occasions, and is printed on a black Canvas brand soft cotton shirt. It is available in small, medium, large, XL, XXL and XXXL. Please note there is no box! 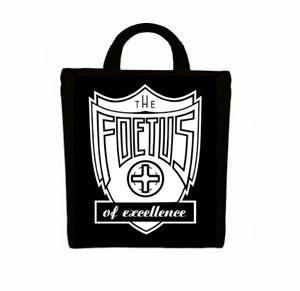 Also available is the Foetus Of Excellence tote bag,The cotton tote bag features the FOE logo in white on a black bag and is the perfect size for carrying vinyl, or anything else your heart desires. JG Thirlwell encourages you to use your tote instead of getting plastic shopping bags at your grocery store! It’s available right here at the Foetus Shoppe.